This report is a collection of 22 map-based habitat report cards, one for each salmon Conservation Unit (CU) in the Nass Area. These report cards are the product of a broad-scale evaluation of the current extent and intensity of pressures on salmon spawning, rearing, and migratory habitats as well as the cumulative risks to these habitats. This type of coarse-scale assessment is useful for building a common understanding of the degree of stress to key salmon habitats and for identifying strategies for alleviating those stresses. 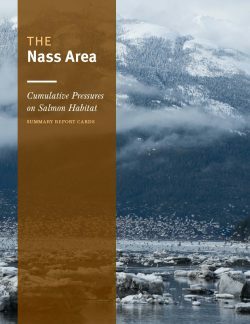 Full details regarding the project methodology can be found in The Nass Area: Cumulative Pressures on Salmon Habitat (technical report).